LAS VEGAS • Good old times need not refer only to the past. With artificial intelligence to detect falls, virtual reality to combat isolation and "powered" clothing to assist the incapacitated, the tech world is stepping up its effort to "disrupt" ageing. 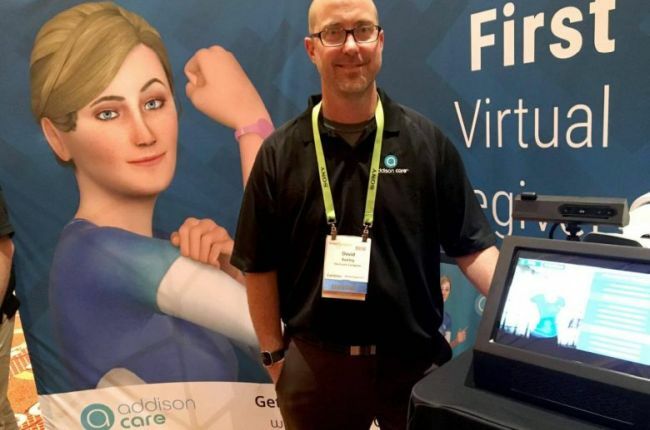 At the recent Consumer Electronics Show (CES) in Las Vegas, exhibitors showcased new ways to help the elderly remain independent, mentally fit and connected. "Everyone knows seniors get lonely, but that isolation can also lead to a lot of medical problems, including the acceleration of dementia," said Mr Kyle Rand, founder of Rendever, a start-up which works with assisted living homes to give seniors a way to virtually visit remote locations. "They can stand atop the Eiffel Tower, they can go on an African safari or revisit their childhood home." Rendever was launched in a Washington, DC, tech incubator created by the American Association of Retired Persons, which in recent years has been funding efforts to develop new technologies for seniors. Other exhibitors touted technology that could help seniors remain in their homes, and give family members peace of mind by monitoring their condition, in some cases using predictive analytics to determine if they are at risk. Walabot, a wall-mounted monitoring system developed by Israeli start-up Vayyar, uses radio waves and three-dimensional imaging to keep tabs on seniors living alone. "You don't need to wear anything, there are no cameras," said Mr Ofer Familier, head of business development for Vayyar. The company, which makes a range of sensor equipment, said Walabot could detect subtle changes in gait, movement or breathing which might signal a risk of a fall or other problem. "We can detect falls but the predictive aspect of it is to monitor changes in behaviour so we can alert family members," Mr Familier said. With the data gathered from the device, "we can classify people as high-risk or low-risk fallers", said Mr David Keeley, research director for Addison parent firm SameDay Security. "We can predict the rate of functional decline." Ms Alicia Mangram, a Phoenix-based trauma surgeon who is an adviser to Addison, said the system can be useful in helping seniors remain independent. "Right now, when we send people home (from a hospital), we don't know what happens to them," she noted. "This allows us to check on them." According to research firm eMarketer, Americans of age 55 and older are the fastest-growing group of electronic wearable users in the United States, largely due to the devices' enhanced health features. For those with mobility issues, California start-up Seismic unveiled its wearable tech body suit which can augment a user's muscles and help him maintain posture. The "core wellness suit", which weighs under 2.3kg and can be worn under street clothes, has robotic components that provide up to 30 watts of power to each hip and lower back to support sitting, standing, lifting or carrying - similar to an exoskeleton but without the bulk. Ms Sarah Thomas, a Seismic vice-president and adviser to tech start-ups, said the new product is designed not only for the elderly but also for factory workers to ease fatigue and anyone with mobility issues. She said tech products for seniors should not be "stigmatised" with unsightly products. "We should be designing with age in mind, but without the ageist perspective," she told a CES panel.